As many of our friends and family know, there is a painting in our church prayer room that is very special to Janan and I. It comes from our friends Bob and Nancy Stouffer and has these words from Zechariah 4:10, “Do not despise the day of small beginnings.” The reason this is so inspirational to us is the significance behind these words. Shortly before moving to Toronto, Bob and Nancy took us to the Brooklyn Tabernacle in Brooklyn, New York. The theme for that evening? You guessed it…Not despising the day of small beginnings! For Christmas last year, Janan happened to place our manger scene directly underneath this painting. One day she happened to remark to me, “Ezra, what could have been a smaller beginning than the one Jesus had when he came to earth?” I had to agree. Here Christ was, God in the flesh, and yet he was born into the most humble of places to the most humble of people. A beginning could not get any smaller. When you look back in history on the great times when God moved among his people, they always started with humble beginnings. For Joseph, they started while spending years in prison for a crime he did not commit. For Moses, they started with 40 years of exile in the wilderness. For David, his small beginnings included spending years being chased like a dog in the wildernesses by an evil King Saul. And for Zerubbabel (the intended recipient of God’s words to Zechariah in this verse), it meant waiting for over twenty years, in the midst of tremendous opposition, as he helped God’s chosen people rebuild the walls of Jerusalem that had been destroyed by the Babylonian empire. Small beginnings are not always exciting. They do not capture the news headlines. But they are tools God uses to grow us up into the men and women he wants us to be. 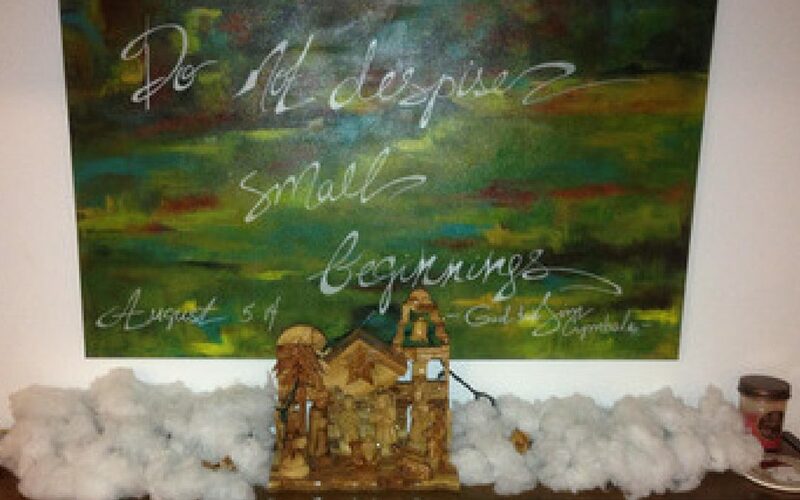 Perhaps this Christmas season you are going through a “Small Beginnings Period” in your life. You are humbled because your children you raised to serve God want little to do with him. Perhaps the business you felt God wanted you to start is struggling and you wonder what the future holds. You pray for a breakthrough…and yet all you hear is silence. Like that humble manger scene, it might seem that the position you are in is rather humbling. One of the most helpful and profound statements he made went something like this, “We tend to only praise God for small beginnings if they turn into something big. But small is wonderful in and of itself.” Since this summer, I have remembered this statement often. This Christmas season, do not allow the humility of where you might be to rob you of the joy that God wants you to have. Despise the shame that the enemy wants to bring upon your life but do not despise the day God of small things. It might just be that in your day of humble beginnings God might be doing and preparing to do his greatest work!